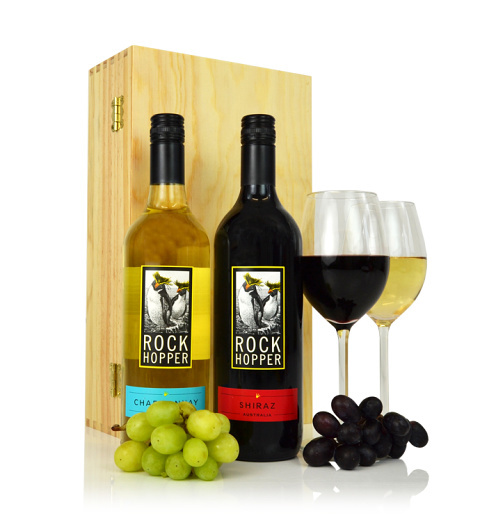 Our Australian Classic duo brings two beautiful Rock Hopper wines that are presented in a wooden wine case. Included is a bottle of Australian Shiraz. This delicious beautiful wine is a medium bodied wine produced from Shiraz and Cabernet grape varieties. Ripe fruit on the bouquet is followed by a plump, round and smooth palate bursting with juicy, spicy, forest flavours. Also included is a bottle of Rock Hopper Chardonnay. This is a fresh and fruity versatile wine that is as delicious on its own or as an accompaniment to any dinner.